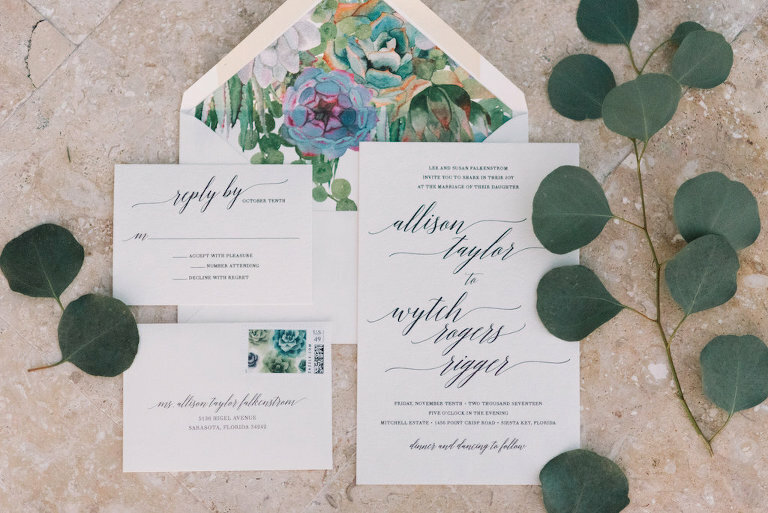 Allison and Wytch’s Siesta Key wedding was held at a private residence featuring an array of florals to compliment their romantic coastal color palette of neutrals with subtle pops of greenery and blush. 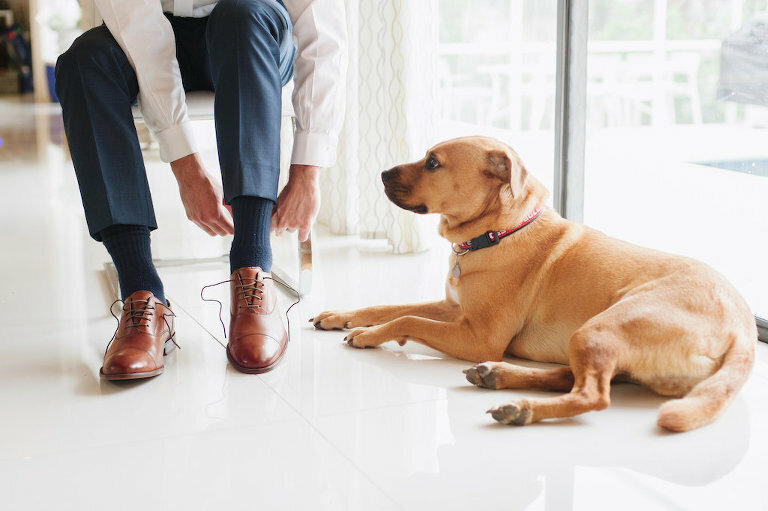 Living in Augusta, Georgia, the couple chose to host a destination Sarasota wedding somewhere where they both love visiting and also near the bride’s family. 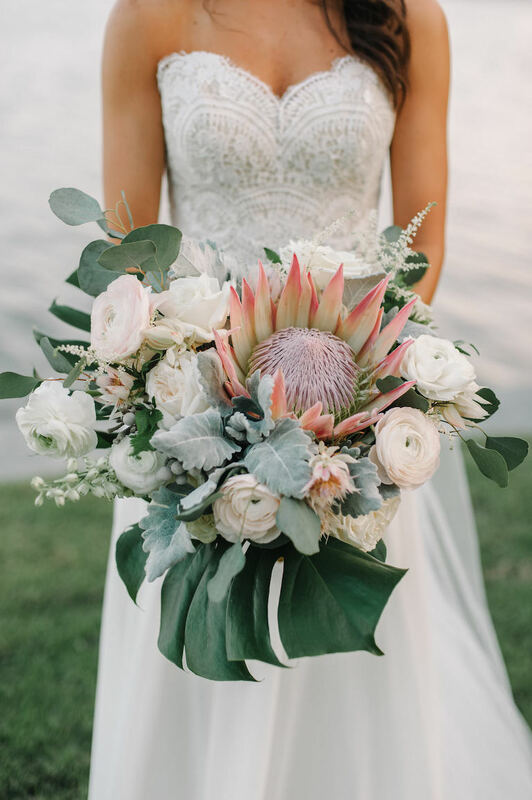 Knowing that she did not want to, nor had the time to plan her wedding, the bride hired Sarasota wedding planner Jennifer Matteo Event Planning to create a casually elegant, coastal design for her waterfront wedding. Seeking a wedding menu with options that would keep their guests full, the couple hired Modern Events off of their wedding planners recommendation. Looking back on their wedding day, we can’t help but admire the fireworks display that was a surprise from the bride’s father, set off on a pier by their home. “Wytch would tell you that his most memorable moment was the ceremony and the few moments after the ceremony when we were ‘just married’ and with our families and wedding party. It was just a nice private moment to celebrate,” the bride reminisced. I refused to plan a wedding, so choosing the wedding planner was my mom’s choice. My planner did it all. We would not have been able to relax and enjoy our wedding day and the days leading up to it without Jennifer Matteo Event Planning. I am not one of those people who does very well with surprises, so I always told Wytch that if he ever decided to propose, it needed to be something private and small. No big surprises and no big event! Wytch proposed at his family’s home in Decatur, GA so we could celebrate with his family, and then we all spent the day at Lake Lanier at my parent’s house with a few other close friends. I Want to Learn More about Catering from Modern Events. Modern Events will contact you shortly! Our wedding planner recommended Modern Events. They created an incredible menu which was served and presented beautifully. Our guests have raved about the food, from the fabulous appetizers and charcuterie display to the delicious family style dinner. We didn’t really have a theme in mind, but based on the waterfront location our wedding planner created a casually elegant coastal design. Hire a wedding planner! We would not have been able to relax and enjoy our wedding day and the days leading up to it without Jennifer Matteo and her team.